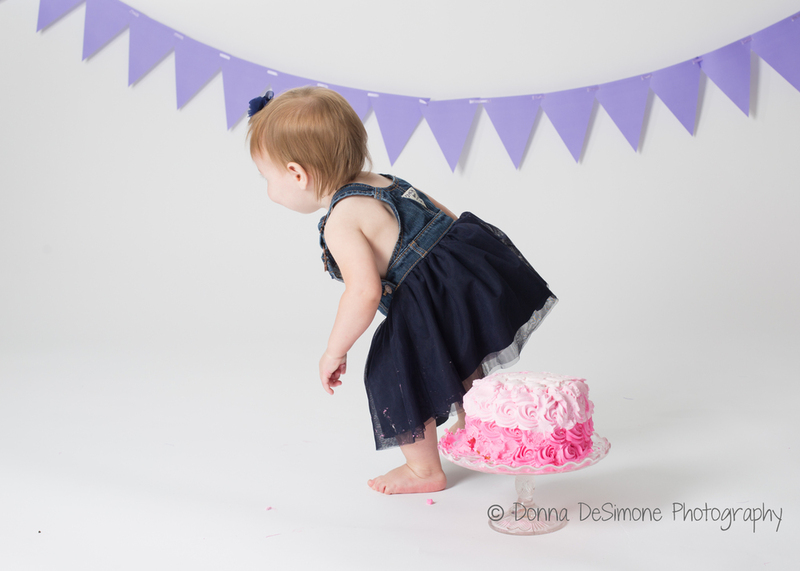 Take a look at this adorable studio Cake Smash session for one year old Nora! This was so much fun in many ways. As a parent of two boys, I was in my glory shopping for some girly accessories including a pink and purple feather boa, purple decorations and, of course, a sparkly tiara! Here are a few highlights from this very fun session! This stunning (and VERY delicious cake) was created by LaCascia's Bakery of Burlington. Nora most definitely has the largest shoe collection of any one year old I have met. This day she only had a couple of pairs with her. Nora is not just a walker, she's a runner! So Mom spent a lot of time getting her into position and then trying to run away before Nora took off. It wasn't easy! And then came the cake! I must say, she was very dainty...at first! I will let the pictures speak for themselves!